One challenge with controlling mutli-agent systems is their inherent heterogeneity. 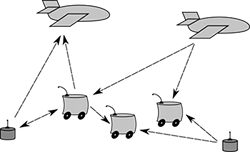 In particular, many missions for multi-agent systems require the construction of motion programs using several types of systems (UAVs, UGVs, mobile sensors, etc.) to achieve the mission’s goal. We propose a new high-level motion description language language (MDL), known as MDLn. This language encapsulates the traditional structure of MDLs, as formulated by Roger Brockett, as well the desired networked information dependencies. Our system is currently implemented in Java and deployed in Player/Stage and on several Khepera III robots. Brian Stephen Smith, Ayanna M Howard, John-Michael McNew, and Magnus B. Egerstedt. Multi-robot deployment and coordination with embedded graph grammars. Autonomous Robots, 26(1):79-98, January 2009. P. Martin, J.P. de la Croix, and M. Egerstedt. MDLn: A Motion Description Language for Networked Systems. Proceedings of the 47th IEEE Conference on Decision and Control, Cancun, Mexico, December 2008. Brian Stephen Smith, Jiuguang Wang, and Magnus B. Egerstedt. Persistent formation control of multi-robot networks. In Proceedings of the 47th IEEE Conference on Decision and Control, pages 471-476, Cancun, Mexico, December 2008. Brian Stephen Smith, Magnus Egerstedt, and Ayanna Howard. Automatic deployment and formation control of decentralized multi-agent networks. In Proceedings of the IEEE International Conference on Robotics and Automation, pages 134-139, Pasadena, CA, USA, May 2008. Ayanna Howard, Lonnie Parker, and Brian Stephen Smith. 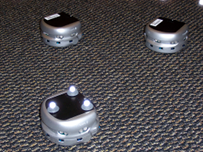 A learning approach to enable locomotion of multiple robotic agents operating in natural terrain environments. Intelligent Automation and Soft Computing, 14(1):47-60, 2008. Brian Stephen Smith, Magnus Egerstedt, and Ayanna Howard. Automatic generation of persistent formations for multi-agent networks under range constraints. In Proceedings of the First International Conference on Robot Communication and Coordination, 2007. Ayanna MacCalla Howard, Brian Stephen Smith, and Magnus Egerstedt. Realization of the sensor web concept for earth science using mobile robotic platforms. In 2007 IEEE Aerospace Conference, pages 1-6, Big Sky, MT, March 2007.